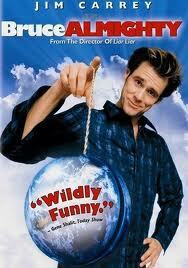 Bruce Almighty: A Spiritual Movie??? The post below is a guest article written by Adrienne Carlson, who regularly writes on the topic of christian college online . Adrienne welcomes your comments and questions at her email address: adrienne.carlson83@yahoo.com. I’m not a diehard fan of the movies, but I do enjoy an occasional date with my television, DVD player and a big bowl of popcorn. I am a diehard romantic and sentimentalist though, because my eyes automatically fill and spill when movies are sad or hopelessly romantic. Some movies have a profound effect on me though, sometimes not in a positive way – I was around 8 or 9 when I first saw Steven Spielberg’s Jaws and suffered nightmares and a fever for two whole days. But there are some experiences that I treasure, because of the impact they have had on my life, like Bruce Almighty for one. Now not everyone would agree that this flick with Jim Carey is a spiritual movie, even by a long shot, but for someone who was so used to complaining loudly with the words Why me God? every time she prayed, this movie seemed like the perfect answer to that often-asked question. To put it in a nutshell, Bruce Almighty tells the story of a journalist (Jim Carey) who blames God for all his misfortunes in life. God then appears in front of him (Morgan Freeman), grants him his powers, and allows him to literally play God. It’s a rollercoaster ride from this point on with Carey using his powers for personal gain, advancing his career and personal life and playing havoc with that of his rivals. When God reminds him that he needs to take answer other people’s prayers as well, he says yes to all of them, without even knowing what they are. And the result is pure mayhem. Carey finally realizes the error of his ways when he sees that his girlfriend has sent in a prayer to God asking for the strength to forget him because she does not want to hurt any longer. He repents and admits that God is omnipotent and omnipresent and that no one can replace him or even do a fraction of his job. The movie made me realize that God does answer our prayers; we only have to be patient and wait for the right time for our prayers to reach God. And if they are not answered, there is a very good reason for God choosing not to do so. In short, the movie taught me that there is a reason why things, both good and bad, happen, and that we must accept God’s destiny for us. It is of no use ranting and raving at him for all the misery that we think we are being put through, because God knows what is good for us. In short, Bruce Almighty made me realize that the Almighty has a tough job on his plate handling the entire world’s problems and that I must not add to them with my constant complaints. Thanks for the review 🙂 I’m often touched by movies… it makes me think about something in a new way… then live moves on and the conscious realization is forgotten. The lessons remain within though, to shape who I am. We are products of our experience. Wow! Thanks you! I many times wanted to ignore in my site something like that.